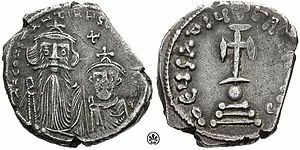 Maximus the Confessor (Greek: Μάξιμος ὁ Ὁμολογητής), also known as Maximus the Theologian and Maximus of Constantinople (c. 580 – 13 August 662), was a Christian monk, theologian, and scholar. In his early life, Maximus was a civil servant, and an aide to the Byzantine Emperor Heraclius. However, he gave up this life in the political sphere to enter into the monastic life. Maximus had studied diverse schools of philosophy, and certainly what was common for his time, the Platonic dialogues, the works of Aristotle, and numerous later Platonic commentators on Aristotle and Plato, like Plotinus, Porphyry, Iamblichus, and Proclus. When one of his friends began espousing the Christological position known as Monothelitism, Maximus was drawn into the controversy, in which he supported an interpretation of the Chalcedonian formula on the basis of which it was asserted that Jesus had both a human and a divine will. Maximus is venerated in both the Eastern Orthodox and Roman Catholic churches. He was eventually persecuted for his Christological positions; following a trial, his tongue and right hand were mutilated. He was then exiled and died on August 13, 662, in Tsageri in present-day Georgia. However, his theology was upheld by the Third Council of Constantinople and he was venerated as a saint soon after his death. It is highly uncommon among the saints that he has two feast days: 13 August and 21 January. His title of "Confessor" means that he suffered for the Christian faith, but was not directly martyred. The Life of the Virgin, the only extant copy of which is in a Georgian translation, is commonly, albeit mistakenly, attributed to him, and is considered to be one of the earliest complete biographies of Mary, the mother of Jesus. Very little is known about the details of Maximus' life prior to his involvement in the theological and political conflicts of the Monothelite controversy. Numerous Maximian scholars call substantial portions of the Maronite biography into question, including Maximus' birth in Palestine, which was a common seventh century trope to discredit an opponent. Moreover, the exceptional education Maximus evidently received could not have been had in any other part of the Byzantine Empire during that time except for Constantinople, and possibly Caesarea and Alexandria. It is also very unlikely that anyone of low social birth, as the Maronite biography describes Maximus, could have ascended by the age of thirty to be the Protoasecretis of the Emperor Heraclius, one of the most powerful positions in the Empire. It is more likely that Maximus was born of an aristocratic family and received an unparalleled education in philosophy, mathematics, astronomy, etc. It is true, however, that Maximus did not study rhetoric as he himself notes in the prologue to his Earlier Ambigua to John, to which his lack of high stylistic by Byzantine standards attests. Nevertheless, for reasons not explained in the few autobiographical details to be gleaned from his texts, Maximus left public life and took monastic vows at the monastery of Philippicus in Chrysopolis, a city across the Bosporus from Constantinople (later known as Scutari, the modern Turkish city of Üsküdar). 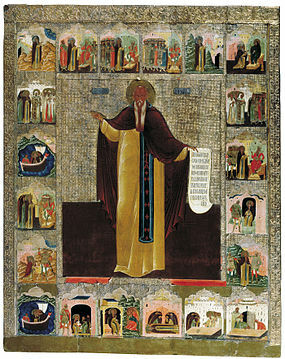 Maximus was elevated to the position of abbot of the monastery. When the Persians conquered Anatolia, Maximus was forced to flee to a monastery near Carthage. It was there that he came under the tutelage of Saint Sophronius, and began studying in detail with him the Christological writings of Gregory of Nazianzus and Dionysius the Areopagite. According to I P Sheldon Williams his achievement was to set these doctrines into a framework of Aristotelian logic, which both suited the temper of the times and made them less liable to misinterpretation. Maximus continued his career as a theological and spiritual writer during his lengthy stay in Carthage. Maximus was also held in very high esteem by the exarch Gregory, the eparch George and the population as a holy man, ostensibly becoming an influential unofficial political advisor and spiritual head in North Africa. 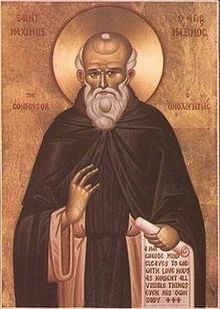 The Monothelite position was promulgated by Patriarch Sergius I of Constantinople and by Maximus' friend and successor as the Abbot of Chrysopolis, Pyrrhus. Following the death of Sergius in 638, Pyrrhus succeeded him as Patriarch, but was shortly deposed owing to political circumstances. During Pyrrhus' exile from Constantinople, Maximus and the deposed Patriarch held a public debate on the issue of Monothelitism. In the debate, which was held in the presence of many North African bishops, Maximus took the position that Jesus possessed both a human and a divine will. The result of the debate was that Pyrrhus admitted the error of the Monothelite position, and Maximus accompanied him to Rome in 645. However, on the death of Emperor Heraclius and the accession of Emperor Constans II, Pyrrhus returned to Constantinople and recanted of his acceptance of the Dyothelite ("two wills") position. Maximus' refusal to accept Monothelitism caused him to be brought to the imperial capital of Constantinople to be tried as a heretic in 658. In Constantinople, Monothelitism had gained the favor of both the Emperor and the Patriarch of Constantinople. Maximus stood behind the Dyothelite position and was sent back into exile for four more years. During his trial he was accused of aiding the Muslim conquests in Egypt and North Africa, which he rejected as slander. Maximus is one of the last men to be recognized by both the Orthodox and Catholic Churches as a Father of the Church. In the encyclical Spe Salvi (2007), Pope Benedict XVI called Maximus 'the great Greek doctor of the Church', although it's not clear if the Pontiff intended to nominate Maximus 'Doctor of the Church' or to say that he already was one. As a student of Pseudo-Dionysius, Maximus was one of many Christian theologians who preserved and interpreted the earlier Neo-Platonic philosophy, including the thought of such figures as Plotinus and Proclus. Maximus' work on Pseudo-Dionysius the Areopagite was continued by John Scotus Eriugena at the request of Charles the Bald. Maximus' work was translated by the 9th-century Irish philosopher and mystical theologian Johannes Scotus Eriugena. In Eastern Christianity, Maximus has always been influential. The Eastern theologians Symeon the New Theologian and Gregory Palamas are seen as intellectual heirs to Maximus. Further, a number of Maximus' works are included in the Greek Philokalia, a collection of some of the most influential Orthodox Christian writers. Ambigua ad Thomam (Difficult Passages Addressed to Thomas) PG91 1032-1060 – Both the Ambigua to John and Thomas are explorations of difficult passages in the works of Pseudo-Dionysius and Gregory of Nazianzus, focusing on Christological issues. This also was later translated by Eriugena. Capita de caritate (Centuries on Love) PG90 959-1082 - Work in the ascetic style of the 'century', where groups of one hundred short sayings are used as meditations during prayer. Capita theologica et oeconomica (Chapters on Theology and the Economy) PG 90 1084-1173 - A work in the ascetic style of the 'century', where groups of one hundred short sayings are used as meditations during prayer. Liber Asceticus (On the Ascetic Life) - a discussion on the monastic rule of life. Mystagogia (Mystagogy) PG91 658-718 – A commentary and meditation on the Eucharistic liturgy. Quaestiones ad Thalassium (Questions Addressed to Thalassius) – a lengthy exposition on various Scriptural texts. This was later translated by Eriugena. Scholia – commentary on the earlier writings of Pseudo-Dionysius. The original edition in Latin of Balthasar Corderius (Antwerp 1634) attributes all of the Scholia to Maximus, but the authorship has been questioned with Hans Urs von Balthasar (1940, 1961) attributing some of the Scholia to John of Scythopolis. ^ Allen, Pauline; Neil, Bronwen (2015). The Oxford Handbook of Maximus the Confessor. Oxford University Press. p. 20. ISBN 978-0-19-967383-4. ^ The following account is based on the lengthy tenth-century biography catalogued as BHG 1234 and printed in Migne's Patrologia Graeca (90, 68A1-109B9). In recent years, however, this account has been called into question on the basis of new scholarly research. The author, or rather compiler, of BHG 1234 turns out to have used one of the biographies of Theodore the Studite (BHG 1755) to fill the gaps in the information he had on Maximus (See W. Lackner, Zu Quellen und Datierung der Maximosvita (BHG3 1234), in Analecta Bollandiana 85 , p. 285-316). The information the compiler of BHG 1234 did have he drew from the passions extant at the time, in which nothing is said about Maximus' early years (See B. Roosen, Maximi Confessoris Vitae et Passiones Graecae. The Development of a Hagiographic Dossier, in Byzantion 80 , forthcoming). On the basis of mostly internal evidence from Maximus' writings, C. Boudignon advocates a Palestinian birth for Maximus instead (See C. Boudignon, Maxime le Confesseur était-il constantinopolitain?, in B. Janssens – B. Roosen – P. Van Deun [ed. ], Philomathestatos. Studies in Greek and Byzantine Texts Presented to Jacques Noret for his Sixty-Fifth Birthday [= Orientalia Lovaniensia Analecta 137], Leuven – Paris – Dudley, MA, 2004, p. 11-43; and id., Le pouvoir de l'anathème ou Maxime le Confesseur et les moines palestiniens du VIIe siècle, in A. Camplani – G. Filoramo, Foundations of Power and Conflicts of Authority in Late-Antique Monasticism. Proceedings of the International Seminar, Turin, December 2–4, 2004 [= Orientalia Lovaniensia Analecta, 157], Leuven – Paris – Dudley, MA, 2007, p. 245-274). If this is true, it confirms the value of the Maronite biography, even though it is clearly anti-Maximian. ^ Constas, Nicholas (2014). Nicholas Constas (ed.). On Difficulties in the Church Fathers: The Ambigua, Volume 1. Cambridge, MA: Harvard University Press, Dumbarton Oaks Medieval Library Series, Volume 28. ISBN 978-0-674-72666-6. M. Gildas (1913). "St. Maximus of Constantinople" . In Herbermann, Charles (ed.). Catholic Encyclopedia. New York: Robert Appleton Company. "This great man was of a noble family of Constantinople." ^ Berthold, George C. (1997). "Maximus Confessor". In Everett Ferguson (ed.). Encyclopedia of Early Christianity. New York: Garland Publishing. ISBN 0-8153-1663-1. ^ Pringle, Denys (1981). The Defence of Byzantine Africa from Justinian to the Arab Conquest: An Account of the Military History and Archaeology of the African Provinces in the Sixth and Seventh Century. Oxford, United Kingdom: British Archaeological Reports. p. 46. ISBN 0-86054-119-3. Herbermann, Charles, ed. (1913). "St. Maximus of Constantinople" . Catholic Encyclopedia. New York: Robert Appleton Company. : "The first action of St. Maximus that we know of in this affair is a letter sent by him to Pyrrhus, then an abbot at Chrysopolis ..."
^ Philip Schaff, History of the Christian Church, Volume IV: Mediaeval Christianity. A.D. 590–1073 (online edition)§111, accessed 15 January 2007. ^ "Maximus the Confessor", in The Westminster Dictionary of Church History, ed. Jerald Brauer (Philadelphia: Westminster Press, 1971) (ISBN 0-664-21285-9). This is generally known as the First or Second Lateran Synod, and is not recognized as an Ecumenical Council. ^ For example, Gerald Berthold, "Maximus Confessor" in Encyclopedia of Early Christianity, (New York:Garland, 1997) (ISBN 0-8153-1663-1). ^ David Hughes Farmer, The Oxford Dictionary of the Saints (Oxford:Oxford University Press, 1987) (ISBN 0-19-869149-1) p.288. This made Martin the last Bishop of Rome to be venerated as a martyr. ^ Walter Kaegi (2010). Muslim Expansion and Byzantine Collapse in North Africa (illustrated ed.). Cambridge University Press. p. 87. ISBN 9780521196772. ^ Hans Urs von Balthasar (2003). Cosmic Liturgy: The Universe According to Maximus the Confessor. Ignatius Press. p. 40. ISBN 9780898707588. ^ Gerald Berthold, "Maximus Confessor" in Encyclopedia of Early Christianity, (New York:Garland, 1997) (ISBN 0-8153-1663-1). ^ George C. Berthold (1985), Maximus Confessor: Selected Writings, p. 31. Paulist Press, ISBN 0-8091-2659-1. ^ For example, see Catholic Forum Archived 2007-06-25 at the Wayback Machine. The injuries Maximus sustained while being tortured and the conditions of his exile both contributed to his death, causing Maximus to be considered a martyr by many. ^ For example, from the biography provided by the Orthodox Church in America: "Three candles appeared over the grave of St Maximus and burned miraculously. This was a sign that St Maximus was a beacon of Orthodoxy during his lifetime, and continues to shine forth as an example of virtue for all. Many healings occurred at his tomb." ^ The Sacred Congregation for the Causes of Saints (Prot. Num. VAR. 7479/14) considers the Pope's declaration in Spe Salvi an informal one. Herbermann, Charles, ed. (1913). "St. Maximus of Constantinople" . Catholic Encyclopedia. New York: Robert Appleton Company. ^ "Maximos, St., Confessor" in the Oxford Dictionary of the Christian Church, ed. F.L. Cross (London: Oxford Press, 1958) (ISBN 0-19-211522-7). One sees this especially in Maximus' Mystagogy and Ambigua. ^ "Maximus the Confessor" in Michael O'Carroll, Trinitas: A Theological Encyclopedia of the Holy Trinity (Delaware:Michael Glazier, Inc, 1987) (ISBN 0-8146-5595-5). ^ "Maximos, St., Confessor" in the Oxford Dictionary of the Christian Church, ed. F.L. Cross (London: Oxford Press, 1958) (ISBN 0-19-211522-7). ^ "Apokatastasis Archived 2006-06-20 at Archive.today" Theandros: An Online Journal of Orthodox Christian Theology and Philosophy. Accessed Aug. 12, 2007. Herbermann, Charles, ed. (1913). "Apocatastasis" . Catholic Encyclopedia. New York: Robert Appleton Company. ^ Hans Urs von Balthasar, Cosmic Liturgy: The Universe According to Maximus the Confessor (Ignatius Press, 2003), 355–356. ISBN 0-89870-758-7. On Difficulties in the Church Fathers: The Ambigua: Volume I, Maximos the Confessor. Ed. and Trans. Nicholas Constas. London: Harvard University Press, 2014. ISBN 978-0-674-72666-6. On Difficulties in the Church Fathers: The Ambigua: Volume II, Maximos the Confessor. Ed. and Trans. Nicholas Constas. London: Harvard University Press, 2014. ISBN 978-0-674-73083-0. The Philokalia: The Complete Test compiled by St Nikodimos of the Holy Mountain and St Makarios of Corinth: Volume II. Ed. and Trans. G.E.H. Palmer, Philip Sherrard, Kallistos Ware. London: Faber and Faber, 1981. ISBN 978-0-571-15466-1. Allen, Pauline; Neil, Bronwen (2015). The Oxford Handbook of Maximus the Confessor. Oxford University Press. ISBN 978-0-19-967383-4. Mitralexis, Sotiris. Ever-Moving Repose: A Contemporary Reading of Maximus the Confessor's Theory of Time. Veritas. Cascade, 2017. ISBN 9781532607035. Mitralexis, Sotiris, Georgios Steiris, Marcin Podbielski, Sebastian Lalla. Maximus the Confessor as a European Philosopher Veritas. Cascade, 2017. ISBN 9781498295581. Tympas, G. C. (2014). Carl Jung and Maximus the Confessor on Psychic Development. Routledge. ISBN 978-0-415-62517-3.